These goods from yesteryear are either too lethal or useless to be sold today. But they’re also just plain weird. 1. 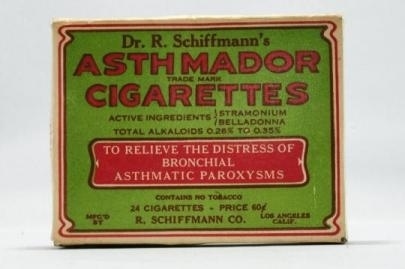 Poisonous cigarettes (to cure asthma). In case the idea of smoking to cure asthma wasn’t crazy enough, the active ingredients are Stramonium, also known as Datura, the most awful drug in the world, and Belladonna, also known as Deadly Nightshade. Yes, that Deadly Nightshade. It’s as strong as whiskey and contains a spoonful of opium for good measure. So it makes perfect sense that this explosive cocktail was a treatment for babies as young as five days old. What exactly it cures, I’m not sure. 3. 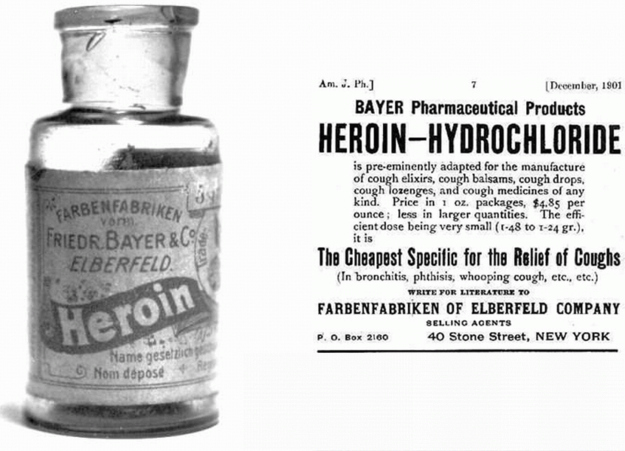 Cough medicine made out of heroin. 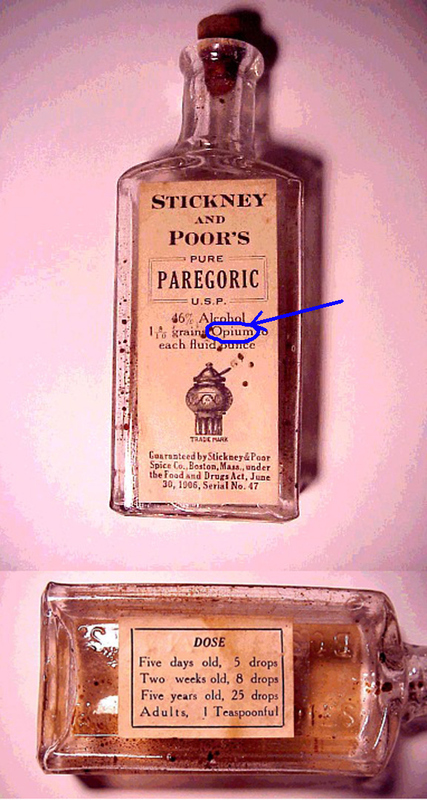 When a few drops of opium aren’t enough, why not try full-on smack? Recommended for the relief of coughs. It’s quite cheap too. 4. 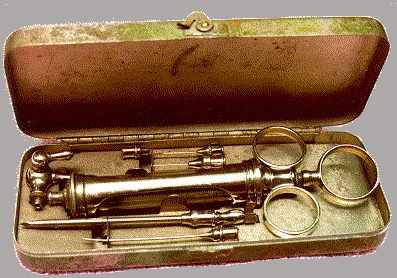 Morphine injection kit from Harrods. Where better to buy your needles than upmarket London department store, Harrods. They were quite a popular present for soldiers on the front during World War 1. 5. 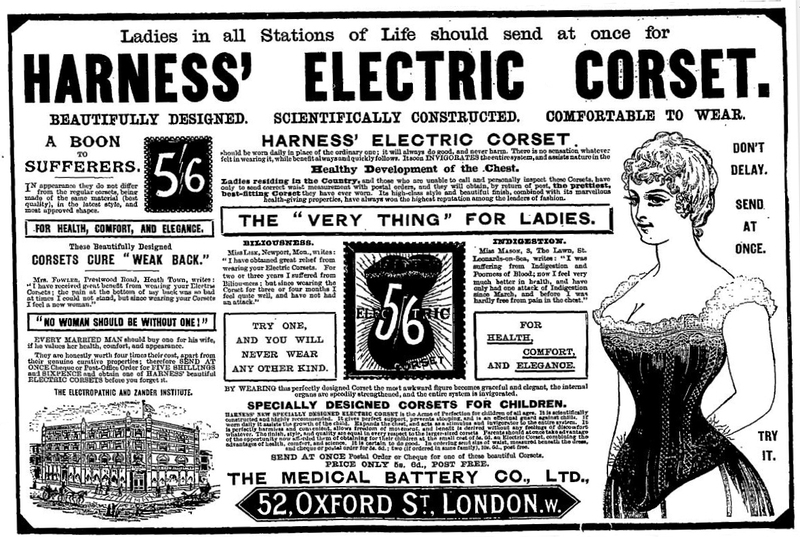 A corset, surging with electricity. The “very thing” for ladies, apparently. What’s great about this particular advert is that it doesn’t explain how adding electricity to an item of clothing actually helped. This glaring problem was actually never explained and the product was later revealed to bea scam. 6. 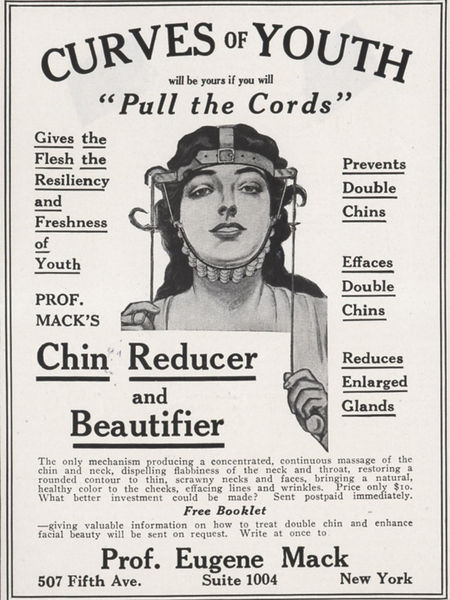 Do-it-yourself double chin remover. As much as I would love to reduce my enlarged glands, this device looks horrifyingly close to a contraption from the Saw series of films. 7. A machine gun, for kids. When I was a kid, we usually made do with making that ‘RATATATAT’ sound when playing soldiers. 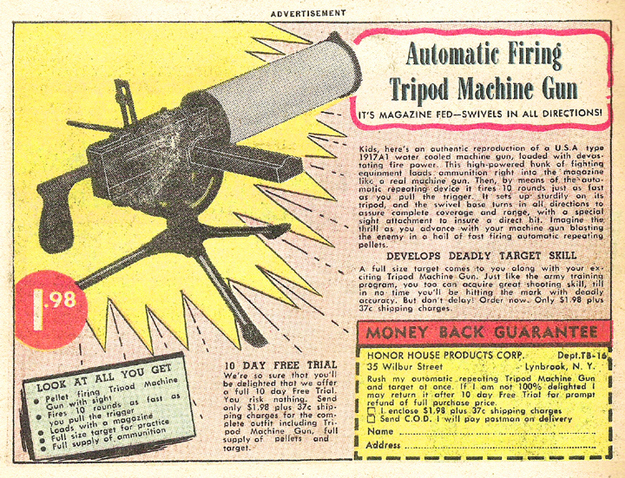 Apparently the kids of the 50s were allowed this magazine-fed automatic pellet machine gun that ‘develops deadly target skill’. I somehow doubt that this could be sold today. 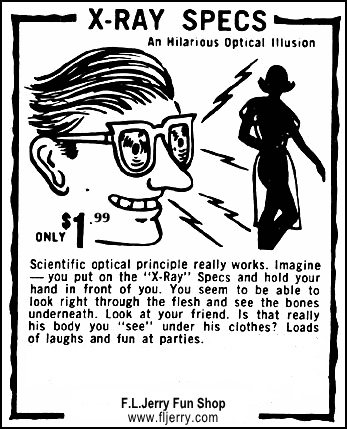 Ah, pervy old X-ray Specs. Not that they ever worked – either to see through clothes or through to people’s bones (this advert weirdly seems to imply that they do both). What it doesn’t say is how dangerous it would be to wear a radiation source as spectacles. It really makes you glow. 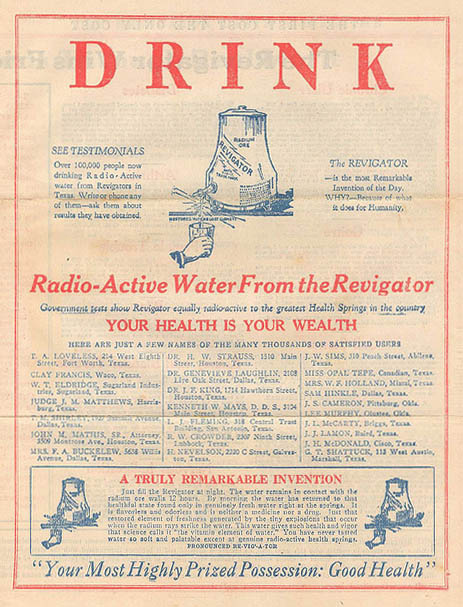 Unlike X-Ray Specs, these products really did have a highly radioactive source in them – radium. 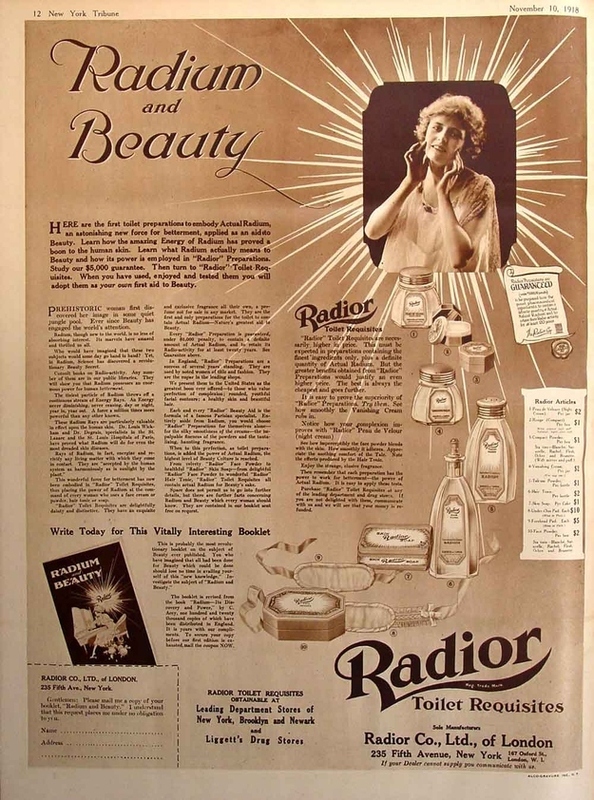 Before the deadly effects of radium were discovered, it was hailed as a miracle cure and was added to almost everything, including beauty products like this. I really do mean everything. 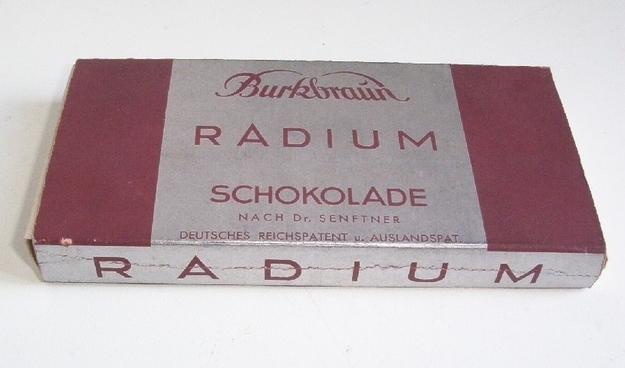 This is for if you wanted to rub radium into your teeth. Or you could just outright drink it. Remember, your health is your wealth. 13. An electronic, vibrating finger. 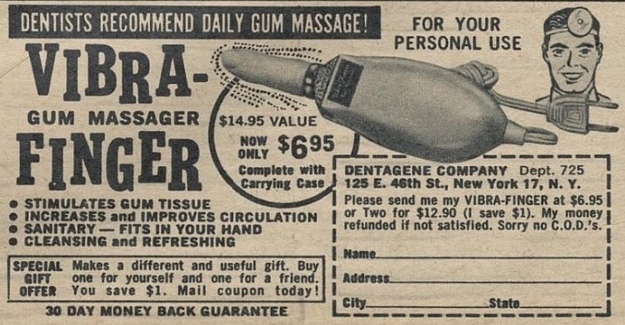 For oral use. 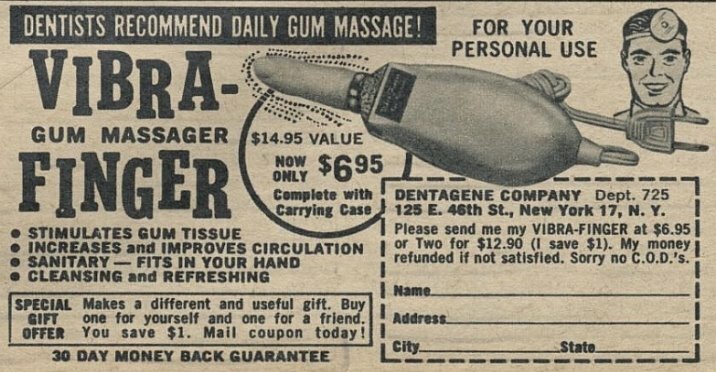 Obvious jokes aside, even if someone did want their gum massaging why the hell would they want to use some horrible chubby finger on a stick? Nothing wrong with ventriloquism, but there’s something sinister about this. 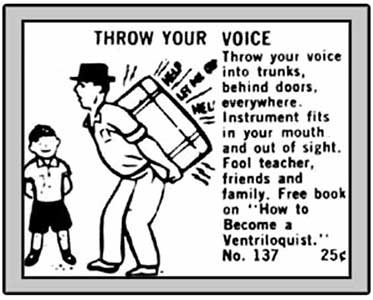 Besides having some nondescript ‘instrument’ lodged in your mouth, this ad seems to indicate that the most fun you can have throwing your voice is pretending that people are trapped inside trunks. 15. Jeans designed for roundhouse kicks. 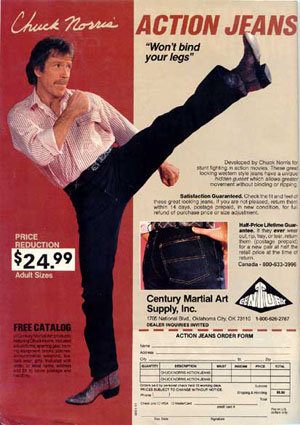 It’s hard to believe that this isn’t a photoshop from 2005, but Chuck Norris did actually promote these ‘action jeans’. Wait, what am I saying, of course these would sell. Memes don’t get old, right? Article originally appeared on BuzzFeed.